We carry several Eastwood guitars, and can order any guitar from their product line. The beautiful Map guitar shown is available in the vibrant colors mentioned below. List price is $1029. Guitar Safari price is $799, or call for special pricing on any new guitar. Some Eastwood models start as low as $399! US History NATIONAL MAP Guitars were made in the USA from 1958-64 by VALCO and sold through Montgomery Ward. This AIRLINE® MAP is a tribute to the NATIONAL Newport Guitar from 1962. Today they are played by people like David Bowie, The Cure, Calexico and White Stripes. Original vintage MAP Reso-glass models now sell for $3,000-$5,000. Attention Knuckleheads! I have one limited run MAP in INDIGO BLUE! One of only 24 in the world. These sold out in a matter of minutes when first released…good luck finding another one for sale. Let’s Talk! The 1950’s Stratotone H44 was one of the coolest blues/slide guitars ever made that featured a short body with a FAT neck. The originals are becoming very hard to find and hard to play! They’ve improved the pickups and the stability of the neck but kept all the vintage appeal of the original. Better than the real thing! Comes in Black, Copper and Taxicab Yellow. Original Stratotones are favored by blues guys Rick Holmstrom and Junior Watson, and are selling upwards of $1500+. Retail price for the new Eastwood model is $649. We offer it starting at $499. Call for absolute best price. You’ll love this guitar! We also carry Republic ukuleles and can order any single or tri- cone guitar, ukulele, mandolin or parlor guitar from their entire product line. NEW! White Pearl Resonator Ukuleles in stock! You will love these. Seriously, get me on the phone and we’ll make a deal on one of these killer guitars! NEW! Steel Body MINIOLIAN Antique Swamp Green (also comes in Reso-Relic, Antique Bronze, Polished Nickel). We are currently offering an introductory rate of only $159 for all AXL guitars, which includes a free gig bag! With a distressed body and antiqued hardware, Badwater Series guitars look and feel of ancient artifacts. These shocking guitars are equipped with EMG-designed pickups for hard rocking tones and clean delivery. Even the headstock and backplate have vintage distressing. No area was spared from the destruction. Badwater guitars have a one-of-a-kind style and excellent playability. The off-white finish has a beautifully rusted appearance. It’s the lost treasure from the backseat of your grandpa’s vintage convertable. There’s something phantom-like about this model .. you’ll have to pick it up to see what we mean. Also available in crackle blue, crackle black, crackle brown/ white and brown finishes. Featuring an all new body design and incredible playability, the Marquee SRO takes you from the garage to the arena with every power chord you play. This original model has a lively body design and features EMG-designed pickups, a solid alder body, a rosewood fretboard, and a classic style pickguard. With excellent pickup configurations and controls, the SRO is perfect for a rock or blues-oriented sound. 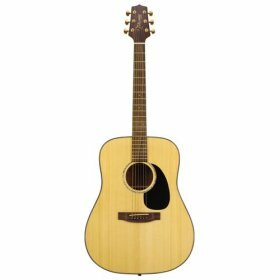 We carry several types of Takamine acoustic guitars and can order any style, color or model. Takamines are a great value, with some models starting at under $100. 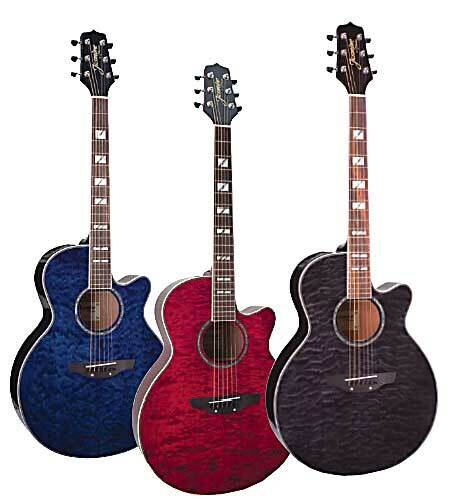 We carry all colors and styles of the Jasmine NEX acoustic/electric guitars. List price is $599, and we offer this guitar at $379, including its very own fitted hardshell case (call for best price) at a better price than Musician’s Friend, with no shipping hassles!. These guitars play like a dream! The ES450C Series Acoustic Guitars come packed with features. NEX cutaway body with a Quilt maple top. The back and sides are made from Mahogany. The fretboard and bridge are made of Rosewood. There is an Abalone rosette and an abalone and MOP fretboard inlay. The ES450C Series also features a Gloss finish and a preamp with a built in tuner.